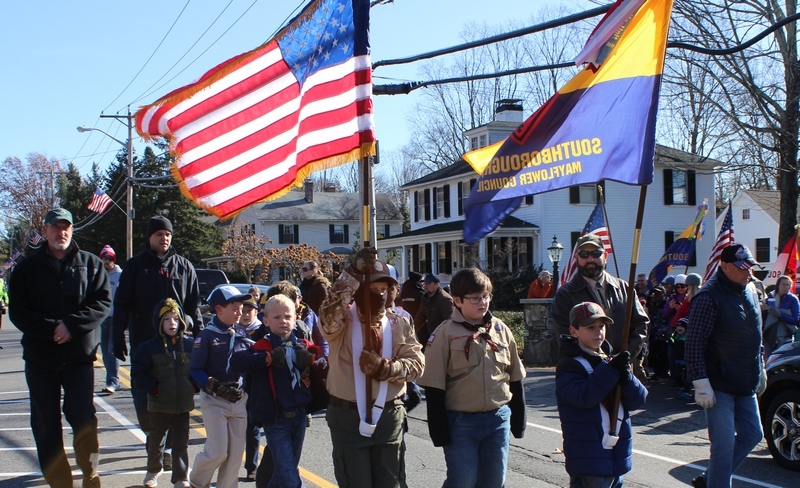 As always, the Town honored veterans on the 11th day of the 11th month at the 11th hour. 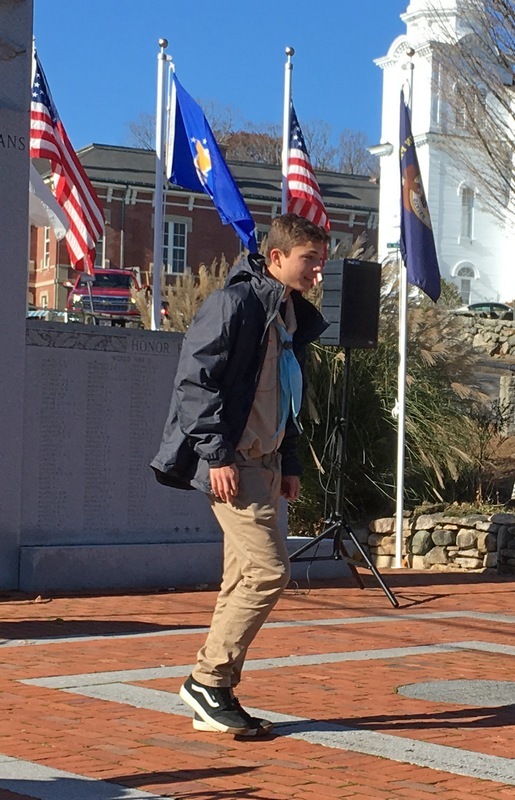 Yesterday, a crowd gathered at the All Wars Memorial in honor of Veterans Day. 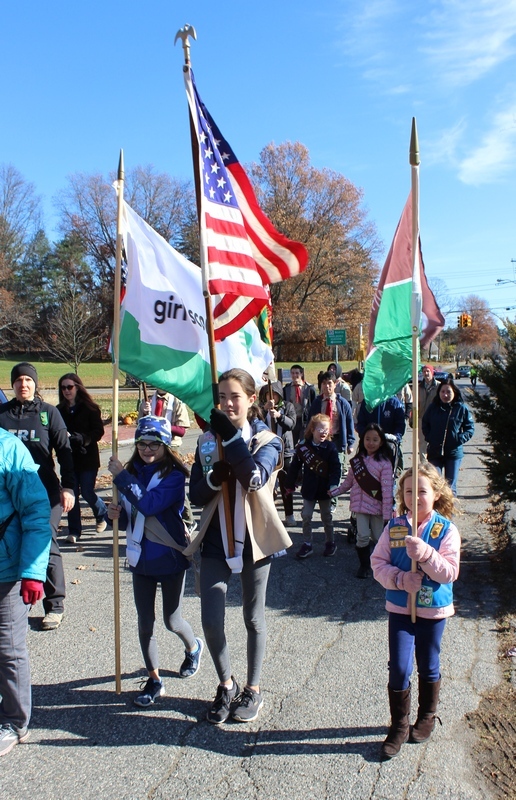 They were met by a short parade of military and Scout members. 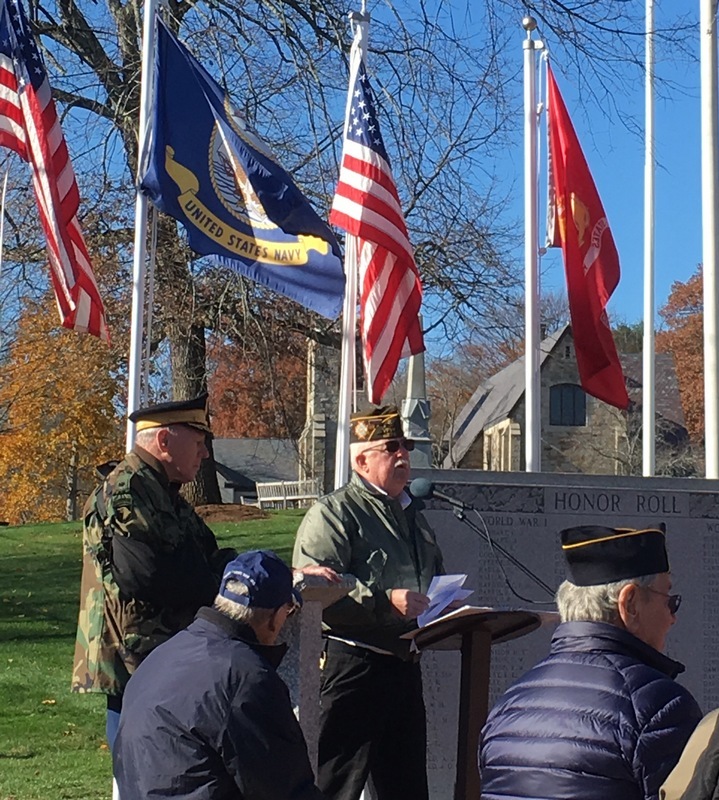 As always, the ceremony included speeches by the Town’s VFW and American Legion Commanders, a Selectman, and our State Representative in honor of sacrifices made by members of the armed services. The event included a prayer of remembrance, the traditional reading of In Flanders Field, and patriotic songs by Algonquin’s Camerata. The ceremony also brought attention to recent initiatives. One was an Eagle Scout project by Troop 1’s Andrew Zalev. He replaced the Memorial’s temporary flag poles with better, permanent poles. Another culminated in an unveiling following the usual ceremony. The All Wars Memorial was constructed in 1968-69 and listed the names of residents who served in WWI, WWII, Korea and Vietnam. Acknowledging the nature of miltary service for the past 28 years, Commander Wilson spearheaded an effort to update the memorial. He worked for several years to collect service records. Mark Fallon and Vanessa Hale worked with him to identify the 83 residents and promote awareness of the project. I didn’t get good photos of the unveiling. (I didn’t want to block the view of family members there to see names that were personal to them.) But you can check out Southborough Wicked Local’s photos from the unveiling and earlier ceremony here. Southborough – As a young man in 1948, Pete DePina volunteered to serve in the U.S. Army. 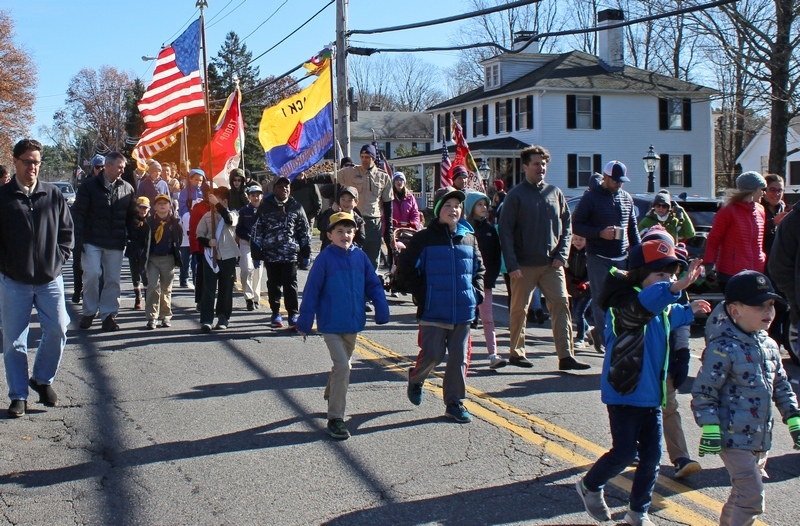 The Southborough resident, reflecting back on his years in the service, noted his surprise that discrimination was prevalent in the military. “Growing up [in Falmouth, Mass. ], my schools weren’t segregated but the Army was and I hated it,” he said. . .
DePina dedicates himself to ensuring that the military sacrifices and contributions of African Americans are not forgotten. As such, he has become a student and passionate advocate who shares the stories of two legendary regiments specifically, the Tuskegee Airmen, and the Buffalo Soldiers. Southborough’s Jim Varney received a special honor this summer. The Korean War veteran flew more than 40 missions over Korea doing photo recon in a B-29. That sometimes included flying 28 straight hours from his base in Japan over Korea. So, it was fitting that the honor paid was a flight to his country’s capital, where he’d never been. 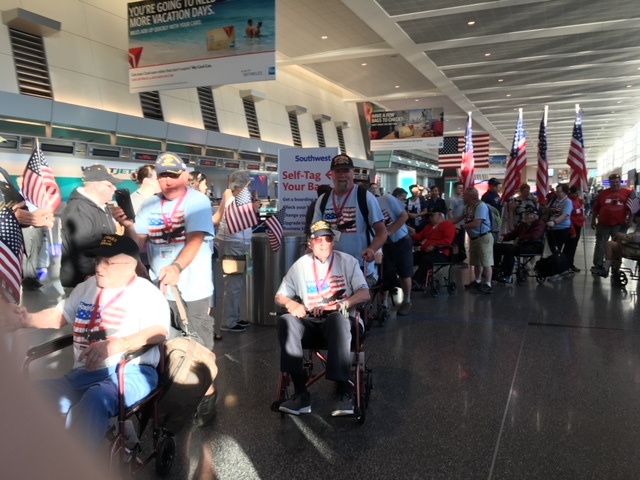 Honor Flight is a non-profit that transports Veterans to Washington, DC to visit the memorials dedicated to honor the service and sacrifices of themselves and their friends. 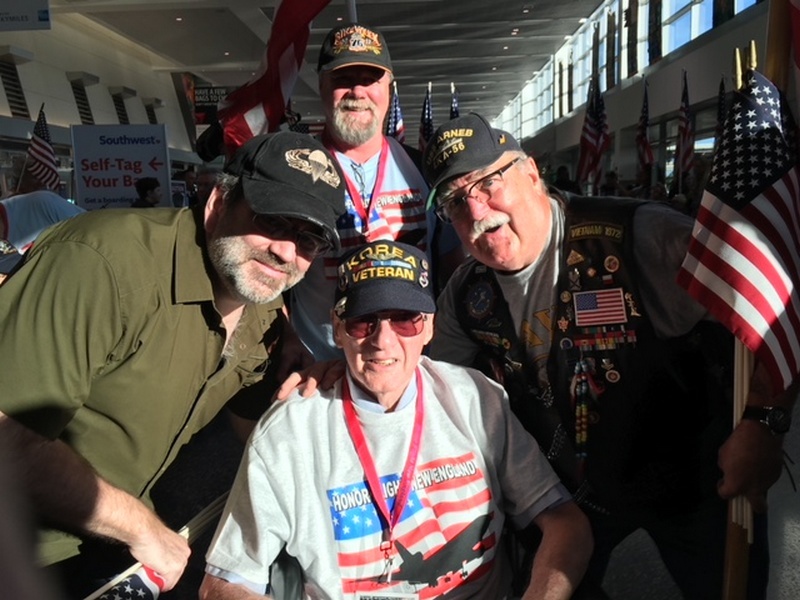 Varney was one of 60 veterans selected for an honor flight this past June. The non-profit covered his costs. 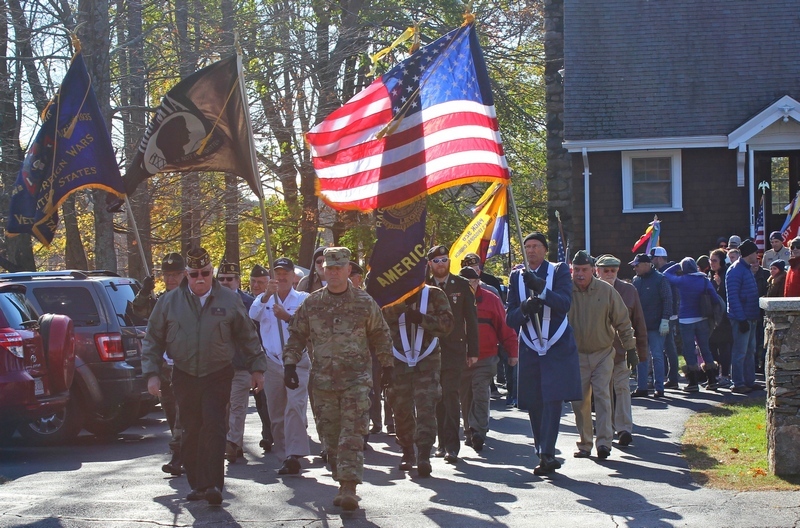 Southborough’s VFW, of which Varney is a longtime member, covered the cost for his traveling companion – his son Mark. *8/2/90 is the date that Iraq invaded the capital of Kuwait, precipitating the first Gulf War. Updated (11/13/18 11:28 am): My apologies for a critical error. I accidentally wrote that Commander Whynot led the memorial project. I knew that Commander John Wilson spearheaded the effort. Beth – 100% of the effort and credit for adding the 83 names to the Memorial – was all John Wilson – Mark Fallon and Vanessa. Absolutely ZERO credit should be attributed to me. This would be one of John’s crowning achievements and I now feel it has been tarnished by even mentioning me with this great accomplishments. Please advise your readers as quickly as possible. Beth – John Wilson, not Steve Whynot, led the work to add the names. 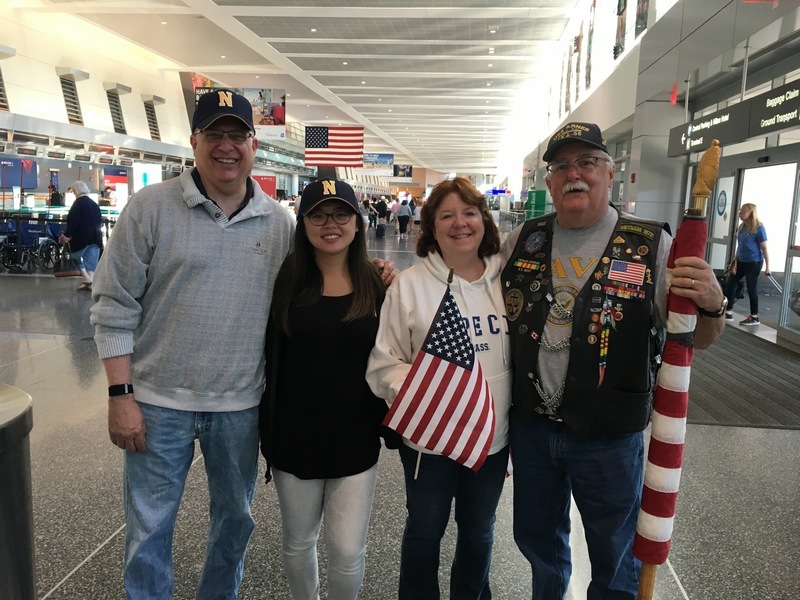 John’s tireless efforts as our Veterans Service Officer often go unnoticed, but are important to those he serves. My apologies to Commander Wilson. Commander Whynot gave him full credit in his email to me. I accidentally typed Whynot’s name instead of Wilson’s and didn’t catch it when I reread the story before posting.